A robotic boy goes on a quest to discover his humanity. Steven Spielberg's remarkable, coldly beautiful vision of the Kubrick-developed Pinocchio story A.I. 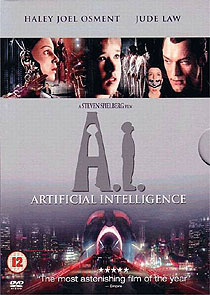 – Artificial Intelligence is a film that seems to have divided critics and audiences. They nevertheless all seem to agree that the film is flawed, and cloyingly sentimental. The film takes place in a small number of contrasting settings, veering from the clinical to the chaotic, and the plot seems similarly structured. Many critics have pointed out that if the film had ended earlier (there are a couple of key points where it could have been truncated) it might have been regarded as a masterpiece. Warner Home Video's Region 2 disc is packaged in a digipack, and comes with about two hours worth of very worthwhile behind the scenes footage covering every creative aspect of the production process across two packed discs. The 1.78:1 anamorphic transfer is outstanding, with stunning visuals presented in a reference quality PAL transfer (there are some patches where the image seems less than optimal, but the disc is a good transfer of the original film elements). Unfortunately British and Australian customers loose out in the sound department. Both versions boast a Dolby Digital 5.1 EX soundtrack (albeit one delivered at the crippled 384kbps bit rate), but the American disc also features a DTS sound mix, (which the R2 and R4 versions drop in favour of an Italian soundtrack).